The local currency is the New Israeli Shekel. Each shekel is worth about 25 cents. 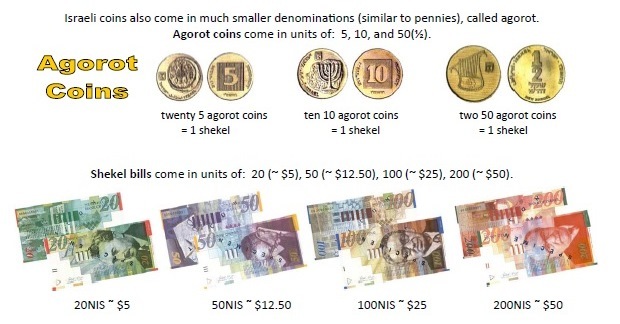 Shekel coins come in units of 1 (~25 cents), 2 (~50 cents), 5 (~$1.25),and 10 (~$2.50), as well as much smaller coin denominations called agorot. Shekel bills come in units of 20 (~$5), 50 (~$12.50), 100 (~$25) and 200 (~$50) denominations. 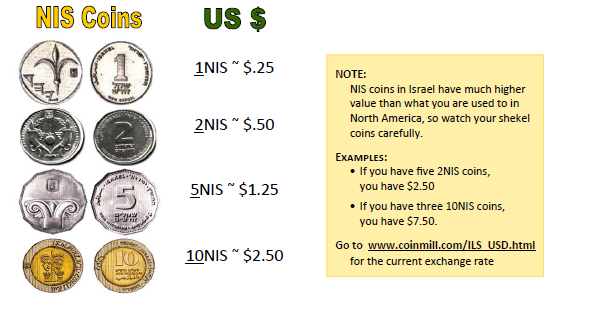 One important thing to keep in mind is that coins in Israel have much higher values than what we are used to in North America, so watch your coins carefully. Go to www.coinmill.com/ILS_USD.html for the current exchange rate. Israel enjoys warm, dry summers (April-October) and generally mild winters (November-March) with somewhat drier, cooler weather in hilly regions, such as Jerusalem and Safed.​ January is the wettest month and June, July and August are the driest months with no precipitation. Average temperatures are listed below.